Apparently BBC Top Gear conducted a showdown of taxis from the world over and the Hindustan Motors Ambassador saw off other competitors from Russia, South Africa, Mexico and the US. I am not sure on which indicator it came out to be the best, but the words "virtually indestructible" were used somewhere. Makes sense; any other car that does numerous potholes at high frequency would come out in nuts and bolts. It is said though, that any repair work and fabrication of failed components can be performed by any mechanic worth his salt, at any garage anywhere in India, with the most basic and easily sourced tools. And that, I have always thought, is the mark of excellent design. Yes...wonderful vehicles...excellent British design from 1950's...modestly improved over the decades by upgrading certain parts [such as the engine, which is now a small, efficient, reliable diesel from Korea]. Ayush Basu: Thank you for the comment, Ray. You certainly know your Ambys. The ones I saw around indicated a 1800cc Isuzu diesel. Well, then. Something to store away into the brain. Ayush Basu: I intend to dig up some episodes from Youtube, if I find any, Chris. They were based originally on an old Morris Oxford from the 1950s as I recall. I think they did try to sell them here briefly a few years ago with a Peugeot diesel engine. Ayush Basu: I do not imagine that was a successful experiment, Bill? Ah - but if you are over 6' 4" tall take it from me they are among the most uncomfortable on the back seat too! Ayush Basu: I hear you Mike. I am only 183 cm and I had to slink down in the seat. Thank you for the comment. Well I never knew that Ayush. Great photo by the way. Ayush Basu: Thank you Chad, just some trivia here. 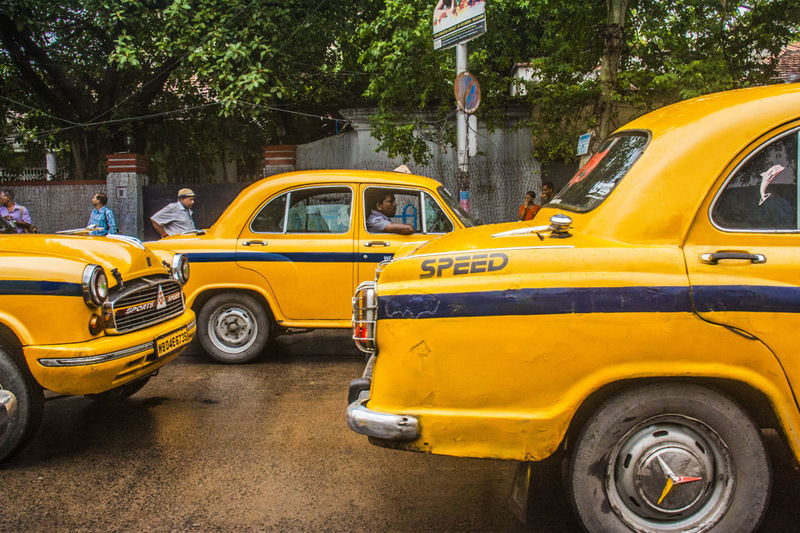 These bright yellow cabs are so eye-catching! Ayush Basu: They used to be black and yellow earlier, LC, now they are like this. Long may Top Gear continue. Ayush Basu: Many thanks, Pauline. I like the photo. Mexican mechanics remind me of what you speak. Since you mentioned South Africa you had my interest. Watched the showdown https://www.youtube.com/watch?v=GbP-GhH5Ci4 which was quite exciting. My interest stems from the fact that most taxis in this country is old model Toyota Hi-Ace minivans. (As in the youtube clip). And I wondered how they compare to taxis from other countries. I am pretty sure they didn't have the real number in the race. One with shocks tied down by wire, a spanner for a steering, the driver sitting on an upturned 20 litre drum, while transporting around 25 passengers. With upwards of 500,000km on the clock. I wonder how this dinkum variation would have fared, passengers and all. Ayush Basu: Talk about pushing boundaries Louis, "sitting on an upturned 20 litre drum". I would like to look up the Topgear episode later tonight, as you did. Funny I did not have this idea before. Thank you for your most interesting inputs. wow.. what a sea of yellow... great shot Ayush! Indeed as Bill says the Morris Oxford lives on although I read recently they are stopping making them altogether very shortly. Ayush Basu: Yes, I found that as well during my read ups. I will present as much in my coming posts Brian, so do come back. I don't think I'd trust Top Gear for any information, given the idiot presenter! Ayush Basu: I do not follow that show regularly but I think I know what you mean, Tom. Ayush Basu: Haha, I did not have much of a choice as I was myself in another car and took this shot during a brief traffic halt. Delighted with your comment, Martin, so thank you very much. Ayush Basu: I think so too Michael. Interesting info on the taxi's - I mean- really!!! Someone feels Merc hubcaps will add a little something. Yes I rate Top Gear also.